Casa Grande Shuttle provides an inexpensive way for you and your party to go to or from either of the Valley’s airports from the Casa Grande area. Our New Pricing is now in effect. We start at $39 for one person. Check our rates and schedule page here. We are giving the 10th RIDE FREE (count beginning September 1, 2017). 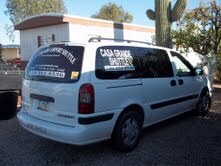 Casa Grande Shuttle follows a zero tolerance policy for our drivers. Any discovered use of alcohol or drugs by any of our drivers will result in immediate termination of driving privileges. See our new pricing here. Personal Checks and Cash OK, or pay in advance when you make your reservation. 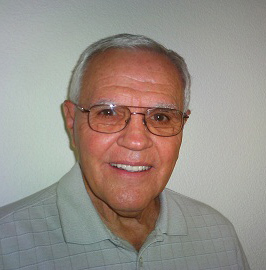 We are in business to provide transportation to the many seniors and others who don’t drive or just need Transportation to the Phoenix or Mesa area for the airports or any other reason. We give the best possible friendly service and WE ARE ALWAYS ON TIME!! We always call and confirm a ride 1 or 2 days before the date of the ride SO YOU KNOW WE ARE GOING TO BE THERE! We don’t mind stopping at Walmart or a drugstore for a prescription on the way home! For your protection our Vans are cleaned, vacuumed and sanitized with an odorless germ killing spray after every run! Our fares start at $39.00 for 1 person. We always give a firm price before you make the reservation depending on how far and where you want to go!! Most importantly, we are licensed by the Arizona Department of weights and measures!They require us to have a million dollar insurance policy for your protection! We now offer an online service to securely pay with your credit card (Online Only). We believe a satisfied customer always tells other friends about us!! GIVE US A TRY, YOU WON’T BE SORRY!! The link below will allow you to request a ride by e-mail. Here are some helpful links to check flight information, please click on the link to go the Airport of your choice.